The Guitar Coach Academy is packed with specially created guitar courses and programs, designed to take you on clearly structured pathways to increase your playing skills, confidence and motivation. Once you dive into the Academy you’ll experience a new level of guitar playing fun, as you discover the missing pieces, currently holding your guitar playing back. The Guitar Coach Academy will provide you with clear route maps to Minimise your learning time and Maximise your results, whether you’re learning new songs, mastering skills, or developing your playing style. 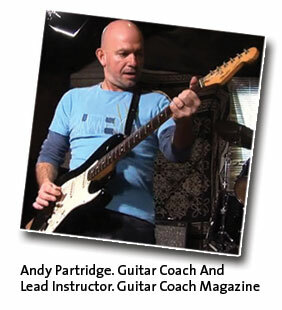 As a well respected player, teacher and coach, Andy Partridge is the lead instructor within the Academy. Andy’s gently step by step approach, and detailed note by note lessons, will give you the confidence, reassurance and motivation you need, to really achieve your guitar playing goals sooner than you thought possible. His relaxed and engaging teaching style (complete with sometimes questionable jokes) make learning easier, faster, and altogether more fun. So if you want to get away from the slow progress and procrastination that comes with not knowing what to learn next, or the demotivation of poor quality and incomplete lessons, then the Academy is right for you. Starting today, you can remove the overwhelm and confusion of too many videos from too many different teachers, that just don’t fit your learning style… And just focus your time and effort to get the best results, fast! Inside the Academy you’ll currently find the following courses and programmes available to you. Plus we are always developing new programs that are automatically added to the Academy just as soon as they launch. Overview: This is a comprehensive 6-week structured program for complete beginners. 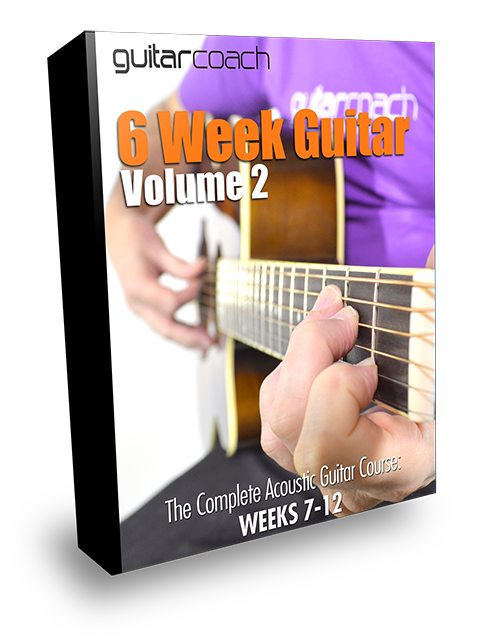 6-Week Guitar Volume 1 covers the core basics of the guitar, but quickly progresses you to playing melody lines, learning chords and strumming songs. 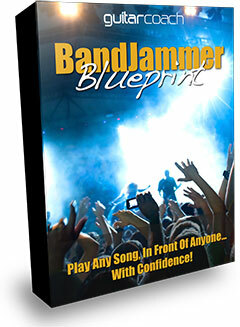 Includes over 80 step by step videos, plus 100 page course guide and practice planner. 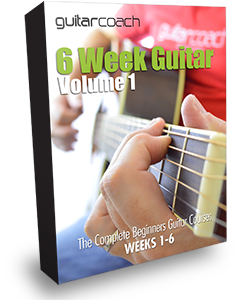 This is Volume 1 of a 5 Volume series, taking players on a clearly structured journey from complete beginner, to confident guitarist. Overview: Volume 2 picks up from where Volume 1 ended, and takes things up a level with more chords, more techniques, more rhythm and strumming, and more songs. In this volume you’ll be building skills in all key areas to help you make real progress, faster. 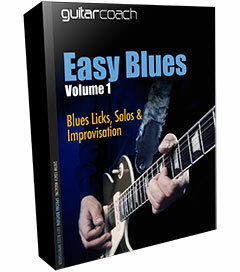 Volume 2 includes a full course guide, some great studio recorded backing tracks and over 100 videos. Volumes 3, 4 and 5 are already in production and will be released into the Academy as they are completed. Overview: This is a growing collection of great acoustic songs for developing your strumming, rhythm and timing. Learn complete songs with these easy, single video sessions. Each session includes chord charts and video tuition. Learn and play along with the original recordings. Includes songs from Van Morrison, the Eagles, and The Kinks (more great songs being added all the time!). Overview: This is a simple, structured introduction to soloing and improvisation. The basis of this course is the E Minor Pentatonic scale, which is no doubt the most often used scale in rock and blues guitar. This course starts from the real basics but will have you creating your own improvisation sessions from the very start with just a few notes. This is a great introduction to improvising and will give you a good foundation to move on to our Easy Blues course. Overview: This structured program is all about making those practice sessions interesting and fun, as well as developing your muscle memory, so you can remove those annoying playing errors. It’s about developing your skills and techniques based on developing your muscle memory. Developing these skills will make your playing become more intuitive, effortless and error free. This 24 Module program allows you to create hundreds, if not thousands of great warm-up routines. Overview: This course is often referred to as a Blues soloing toolkit. 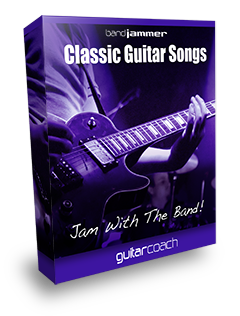 It contains all the components you need to create hundreds of individual solos, playing along to our great blues backing track. This course will take you through the E Minor, E Major and E Blues scales and show you the licks that work with each scale. 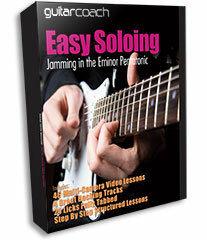 This really is a mini toolkit to create some great solos and really have fun, quickly and easily. Once you’ve had some fun with the Easy Blues course, you can take it up a level and learn how to recreate the playing style and signature licks of blues great such as BB King, Jeff Beck, Joe Bonamassa, Stevie Ray Vaughan and many more. 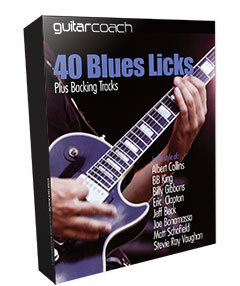 This 48 video course is complete with 40 Blues Licks, full Tab and Backing Tracks. Overview: Master 42 all time Classic Guitar Riffs. 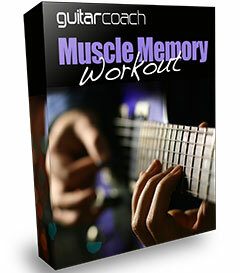 Master some all time classic guitar riffs and impress your friends and family! 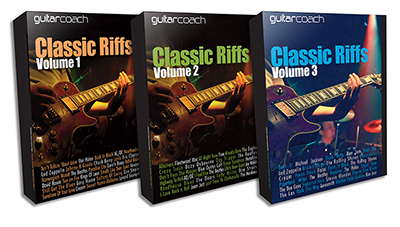 This collection of 42 classic riffs includes a total of 124 videos and over 6 and a half hours of video training. Plus there’s full accompanying tab and backing tracks. Overview: This is the big one! This is for players who want to have the confidence to play with others. The goal here is to learn one of the 30 great songs available and then take your place in our band for a full jam session. You can learn to take the place of the rhythm guitarist or lead guitarist, learning each song step by step. There’s around teaching 24 videos for each song, so everything’s broken down into real detail. This is a unique experience and if you’ve not tried it, then you’re in for a real treat! 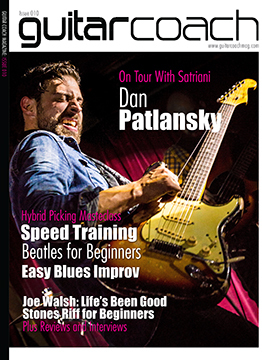 Overview: In addition to the above course, you’ll also find all the content, articles and lessons from within the Guitar Coach magazine, plus additional sessions as we record them. Also every new course or program we create is automatically added to the Academy, so it’s a resource that keeps growing with you. Fantastic Value. Great Results. Guaranteed! You can experience everything within the Academy for yourself right now, for just $1. Your $1 investment today will give you a full 30 days of unlimited access to fully test drive Academy experience. During those 30 short days, we believe you’ll experience the biggest boost to your guitar playing in the shortest time possible. But, if for any reason you don’t feel excited or motivated by your playing progress during those 30 days. Or if you don’t experience the buzz of knowing that you are becoming a better player, then no problem. You can simply cancel your Academy trial at any point during the 30 days, and we’ll even refund your $1 if you wish! The Academy support team are available to you at any time. Just click on the Green “Help?” button in the bottom right hand corner of your screen. This button is on every single page of our site, so you can contact us whenever you wish and will be happy to assist you in any way we can. So for the next 30 days, dive into the Academy. Try some of the exciting and fun courses and programmes. Watch and download videos, tab books and backing tracks if you wish. Really try everything out and just have some fun, and experience what being part of the Academy can do for your guitar playing. Then once your 30 day trial period is over, you will automatically be upgraded to a full Academy member and be charged the low monthly fee of just $9.95. But there are no tie-ins or contracts. Your membership can be cancelled at any time, by simply contacting the Academy support team via the green “Help?” button. It’s quick and easy, and we’ll always be delighted to help and assist you. So click the Add To Cart button below right now and try the Academy for yourself! Feel, Believe, And Know You’re Going To Become The Guitarist You Dream Of!